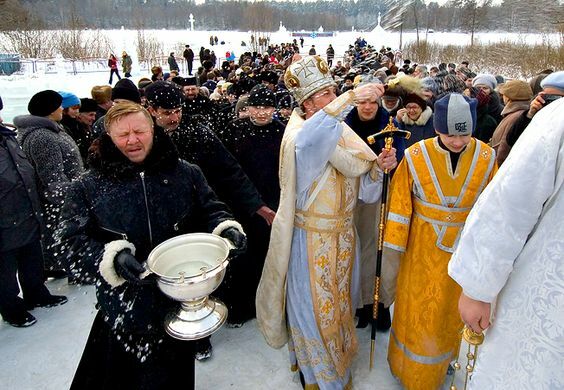 On holidays and special occasions, Russian believers will all suddenly empty out of the church and proceed outside, whether it’s swelteringly hot or snowing, and follow the cross and the priests... sometimes for a walk around the church, other times for hundred-mile hikes. Russians love the tradition. Sometimes cross processions are held to celebrate church holidays, such as Easter when the procession occurs at midnight. Everyone in the church files out and walks around the church three times, singing resurrection hymns. The empty church symbolizes the empty tomb of Christ. 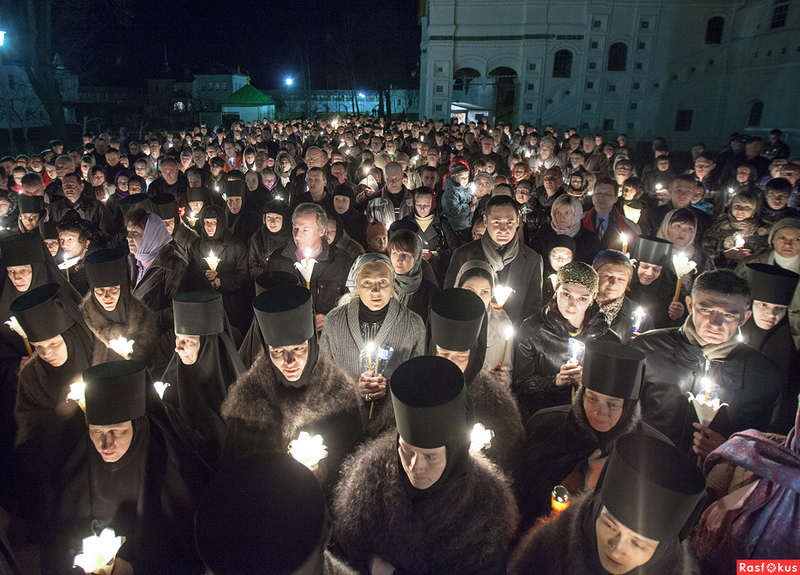 Some monasteries have daily processions in the evenings. Monks walk around the perimeter of their monastery with candles. After they return to the gates of the monastery and re-enter it, the monastery is locked for the night. This procession is believed to protect the monastery from all evil and turmoil for the night. There is another, especially popular, type of cross processions that reenacts spiritual journeys of saints or miracle-working icons. One of the most famous ones is a 92-mile walk to the place where, in 1382, the Velikoretsky miracle-working icon of St. Nicholas was found. Though the icon itself disappeared during the 1930s and the Soviet Regime outlawed cross processions, pilgrims continued coming. Despite the danger of being harassed, arrested and some even executed, unofficially, the tradition continued throughout the entire Soviet period. In 1990, it was officially reinstated.Today, the procession mobilizes up to 60,000 people and lasts a week. Nights are spent in the fields. According to a famous Russian priest, cross processions are physical expressions of " one communal national faith and zealous prayer for help and grace.” Indeed, the immeasurable zeal of people who joyfully dedicate a week to communal, religious marches to glorify God is absolutely stunning and inspiring. 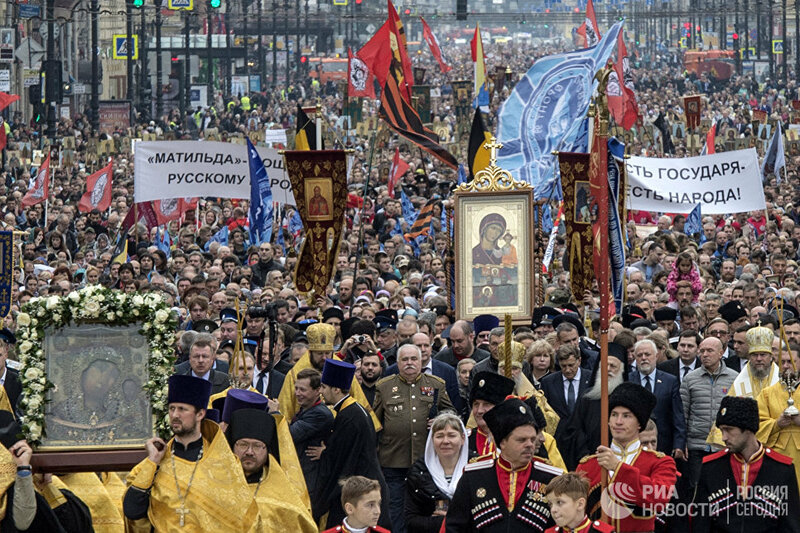 Here is another wonderful photo essay from a St. Petersburg procession earlier this month. It mobilized almost 100,000 people!